New russian super-manoeuvrable fighter is a further development of Su-27 and Su-35. The first prototype flew on April 2, 1996. Yeah, maybe if Russian have a sufficient funding, perhaps they can make an advanced fighter from the flankers, or maybe from the fulcrum too. This is a nice aircraft, but saddly, it doesnt develop further and cancelled. Some think the Su-27 was built to combat the F-22, but the 37 really was. What's the difference between the 37 and the 35. In combat the F-22 would lose miserably, not that you'd hear any American pilots admitting that. The SU30MKI did well in exercises against Typhoon, Tornado & Euro-fighter but still debate over the Red Flag engagement with F-15; I believe C models. When you consider that 1 F-22 took on about 6 F15 E's in a test engagement and splashed all 6 before they knew the Raptor had engaged. The Raptor can hold its own against the best anyone has to offer (avionics and electronics) but when you add stealth they haven't got a prayer. 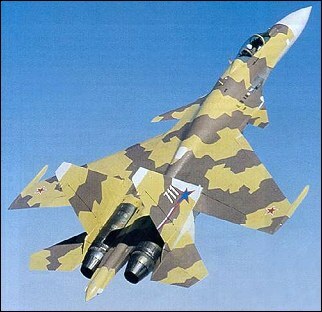 if there is sufficient funding the sukhoi flanker series can be developed as world's most advanced fighter. F-22 maybe but F-35 not a chance. F-35 is a flying pan!!! well apparently this plane is so good the Russians only needed 2. I can never work out why people dismiss Russian aircraft as rubbish whilst saying compared to the F-22.............etc.Look how the Indian SU-30 performed against the F-15 at the red flag exercises.I'd give this more than a fighting chance against a Raptor. How in the world can this be the best fighter ever? Unlike the F-22 which is in active service only TWO Su-37's were ever built. As was said this is still "only" a 4.5th generation fighter. Along with the Rafael, Typhoon II and F-18E/F Super Hornet.